After what seemed like unanimity and a strong sense of purpose at the Planning Commission, the Council discussion about Accessory Dwelling Units has been dispiriting to watch thus far and the public comments even more so. Since the Council will have another go at ADUs today, Tuesday, April 9, 2019 at their worksession, I’d like to try and reframe issue – or at least the structure of the discussion – rather than repeat the same pattern. 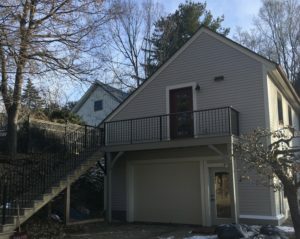 At previous meetings, three Council members consistently talked about the policies supporting the ordinance to encourage more ADUs as one way to expand the housing supply and benefit the Northfield community as a whole. I wouldn’t call these groups adversarial, but they are talking past each other and relying on different kinds of evidence. Each of these values statements, I’ll argue, requires Northfield to change how it does business, sometimes in painful ways because Northfield, like most places, has developed in a way which is exclusive, expensive, and unsustainable. 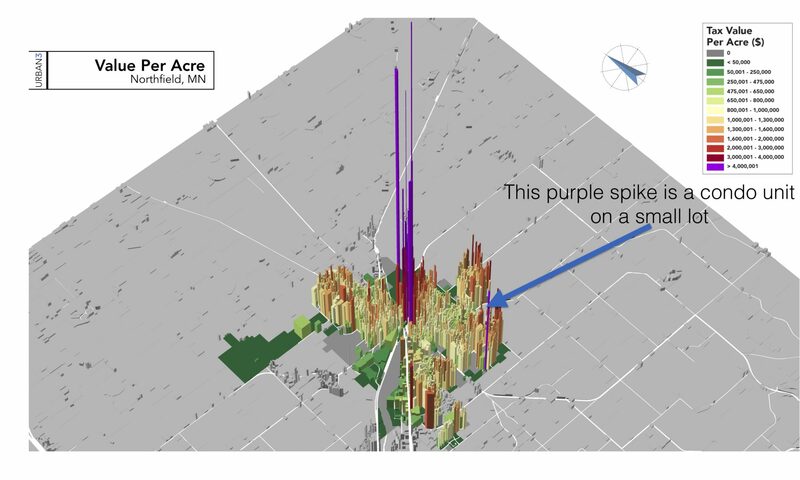 Exclusive: Building hundreds of acres of larger single-family homes has segregated the city by income and excluded lower income residents from large parts of the city. Cheaper housing and multifamily housing have been largely pushed to the very edges in the least connected places. 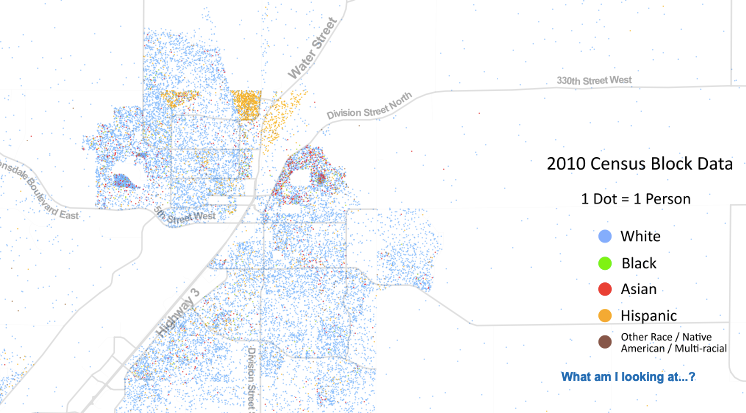 Our families of color are farther from school, large parks, and shopping. Senior housing is removed from our other neighborhoods. Expensive: Requiring minimum lot sizes and large setbacks (revised somewhat in the most recent Land Development Code) and wide streets, as well as allowing developers to determine street layouts has dispersed and disconnected the city. 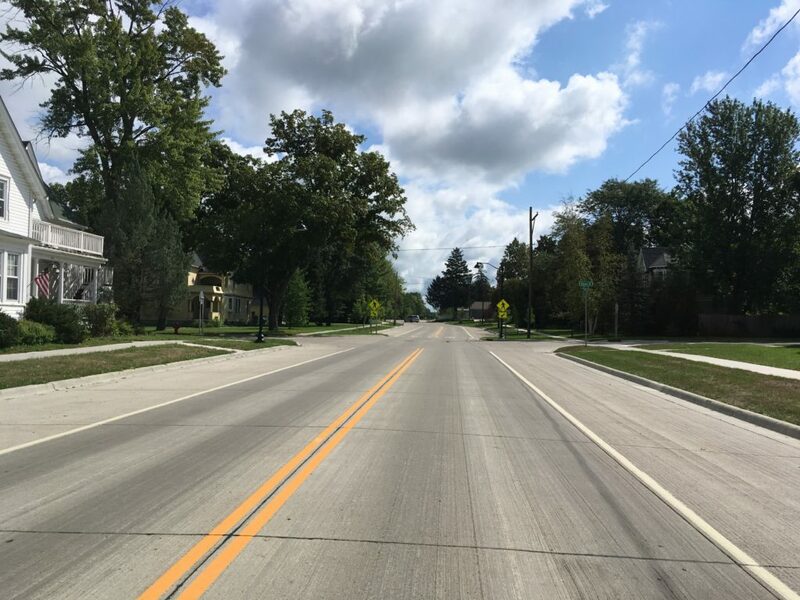 As you well know, Northfield is working to assemble funding for the 246/Jefferson Parkway intersection reconstruction right now – an intersection which must accommodate much local traffic because other routes were truncated. Focusing on highway commercial development means more driving and more road miles to repair. 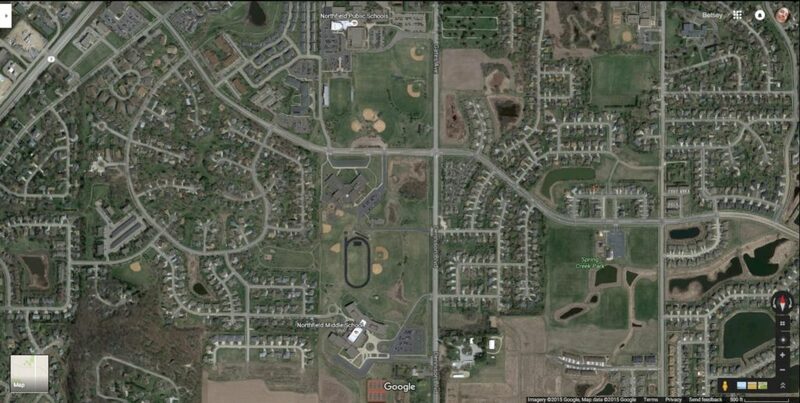 As Urban3 demonstrated last year, this pattern generates less tax revenue. 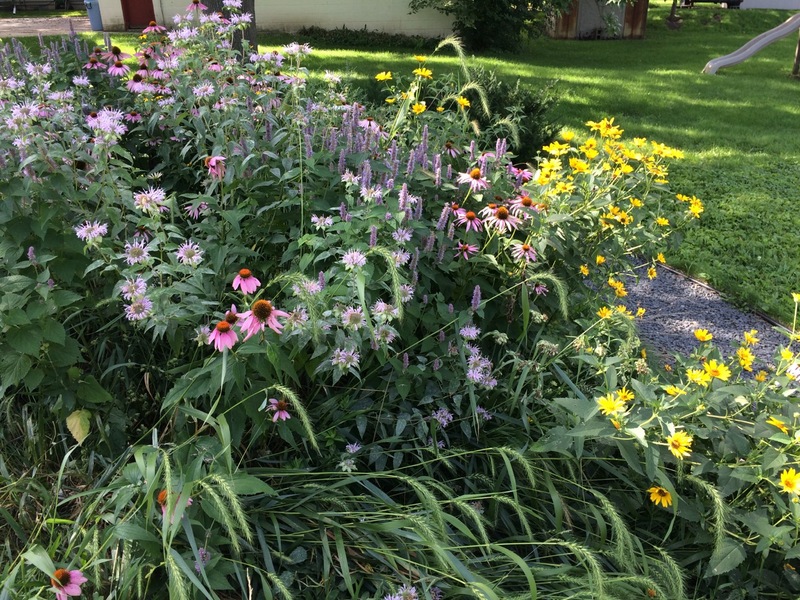 Unsustainable: As Northfield drafts its climate action plan, we must think about the development pattern in climate terms, too, and how this pattern has required more driving, created more stormwater runoff, using more land, made providing transit service more difficult. ADUs will not solve these problems for there is no single or easy solution for changing a decades long growth pattern. 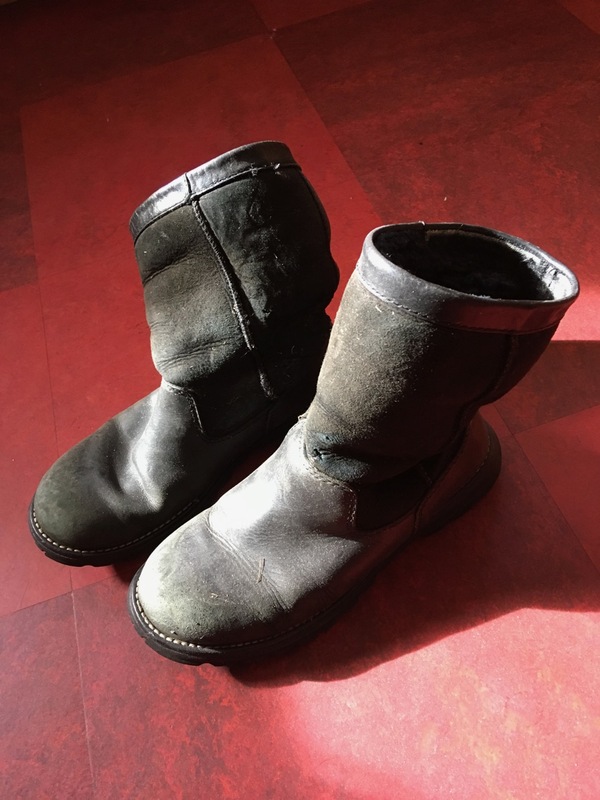 But allowing ADUs is a very small step toward changing our habits and, perhaps more importantly, gives Northfield a great opening to talk about what matters. 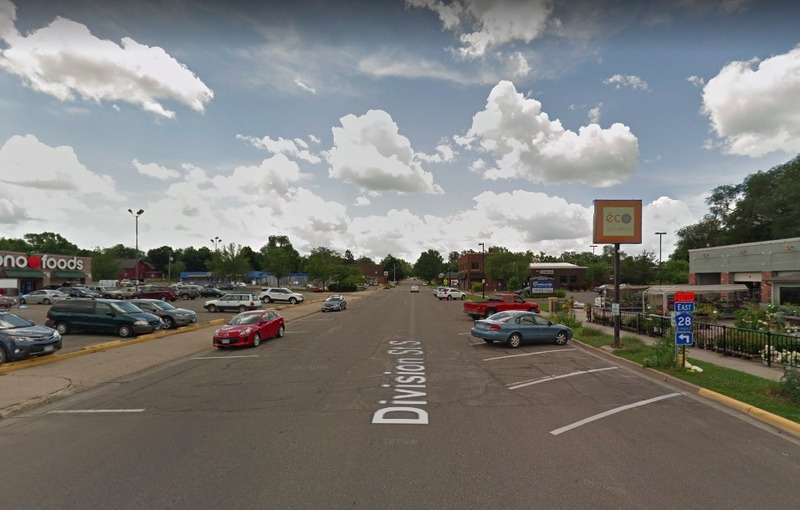 Parking: Removing the minimum parking requirement is part of questioning how much of Northfield’s valuable and limited land must be dedicated to cars (as Urban3 showed us recently) and removing parking minimums has not had adverse effects in other places. As well, other recent research shows a causal relation between zoning code parking requirements and increased in driving. 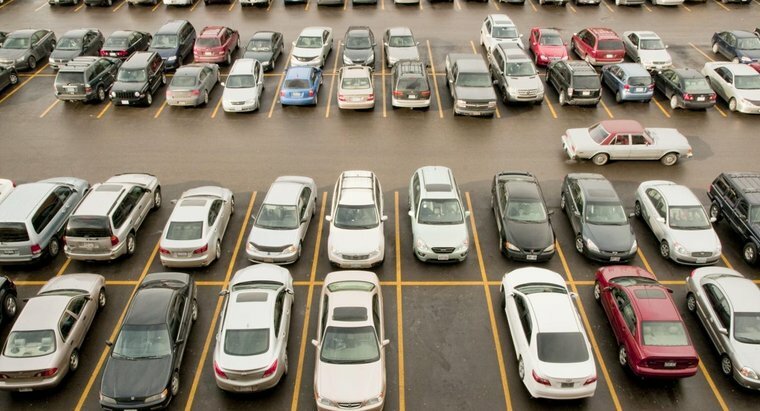 Parking should be added when there is a demonstrated need for it, but not required (for there are older non-drivers, people with disabilities, and those who choose not to drive). Plus, required parking adds to the cost of building the ADU and locating that space (plus access to it) makes it much harder to build ADUs on smaller lots. Size: Current regulations allow an ADU up to 864 sf and 24’ high as a second story on a detached garage which ensured a one level (on the second floor) limited to the footprint of the car storage. 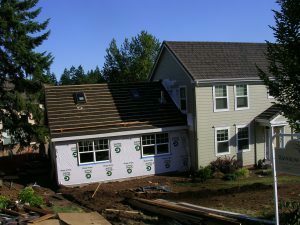 The Planning Commission wanted to ensure small homes were not unduly penalized by requirements to limit ADUs to a size calculated as a small percentage of the primary dwelling, but some confusion resulted and can easily be fixed. 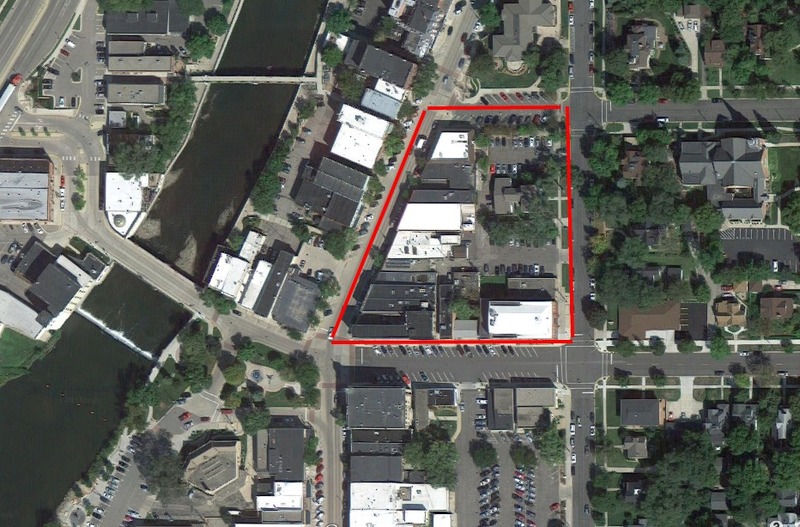 Lot coverage: The zoning code limits buildings to 30% of the lot. That means almost 2/3 of the property must remain unbuilt, a requirement which impacts smaller lots especially harshly. The rationale for this provision in the LDC was to prevent “monster homes” or the sort of tear-down problem some desirable Minneapolis neighborhoods face where smaller older homes are demolished to build much larger homes; this has not been an issue in Northfield. The lot coverage requirement impacts more than ADUs, too. Building single level homes on smaller lots proves impossible; the Zoning Board of Appeals recently granted a variance to the lot coverage limit to allow new one-level construction in one of our newer subdivisions. Neighborhood compatibility: The stated purpose of these standards in our code is “to protect the character of existing residential neighborhoods.” Maybe this looks like a harmless way to avoid really horrible design, but it is not. Rather, it is a strategy which looks to continue the ways zoning has been used to privilege some groups and some people. More bluntly, Trying to preserve the character of a neighborhood (even if it could be determined what the character is) is an attempt to prevent change and, perhaps, keep out people not like ourselves. Removing compatibility requirements was intended as a very small step toward considering the systemic bias in how we build. More practically, asking for city staff to assess compatibility and character is hopelessly subjective and more objective requirements such as having the ADU match the materials or features of the primary dwelling means adding to costs by requiring more customization, perhaps more expensive materials, and preventing use of some modular products. from Neighbors for More Neighbors an advocacy group working for abundant homes in Minneapolis. Talk to your friends about zoning! For the Council members focused on small regulations, consider I ask you to take a step back and ask some difficult questions implicit in the proposed ADU ordinance. Strategic Priorities: Northfield has a real need for more housing, greater equity, and more sustainable development as you wisely identified based on real data. Please talk to your colleagues about the Planning Commission’s choices and their importance in taking a small step in a better direction. Public input is not a referendum: You have been deluged with calls and emails about this issue, but public comments are not the same as votes on an issue. Many negative comments have two characteristics. First, they focus on some small negative impact for which they have no evidence that is will actually occur (and research from other areas indicates these problems will not occur). Second, the comments are made by the people who are already empowered and have access to housing and to government. 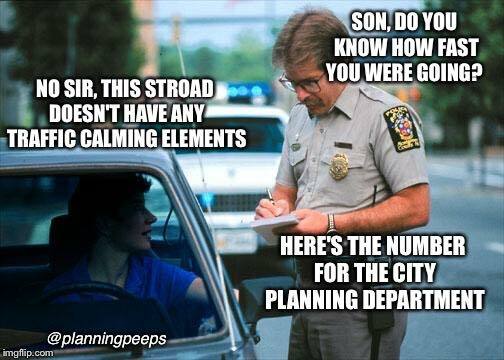 Some of their fears are incredible (tar paper shacks and lean-tos) and others (parking and rental concerns) are related to enforcement of other ordinances. For the big picture people, the task is different. My experience on the Planning Commission and Council is that good policy is relatively easy to adopt, but also easy to ignore at the point of a project or other decision when people are telling you how much this ordinance will affect them right now. But the big picture is important – don’t give up on the big picture, but consider a few small fixes. Strategic priorities: You already know about the real need for more housing, greater equity, and climate action. 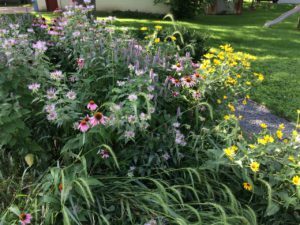 Keep helping your colleagues understand Northfield’s particular problems and why the Planning Commission’s choices make sense for helping Northfield become an even better place. Please call out how data-driven policy should not be undermined by individual fears. Public input is not a referendum: See above. For me, the most disheartening feature of the Council discussion has been the disproportionate weight given to people like me – white, affluent, homeowners for whom government (and everything else) works very very well. 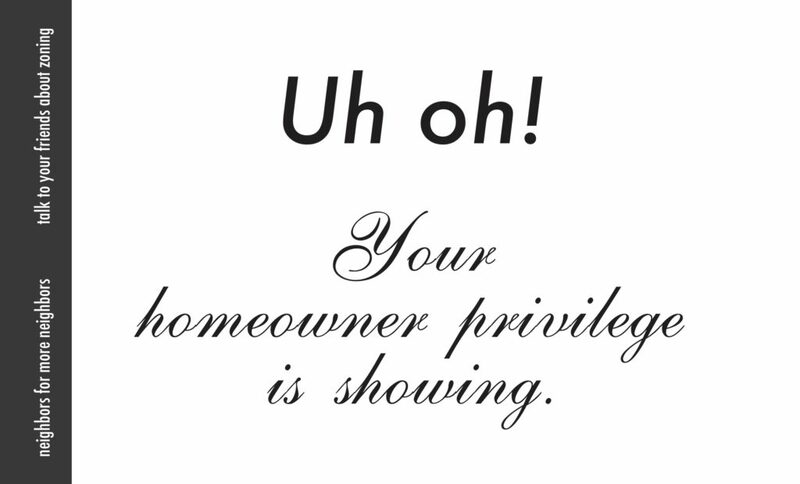 It takes some serious rethinking to understand how much privilege is embedded in the zoning code and my hope is that the ADU conversation will start the difficult discussion about how we build a really more inclusive neighborhood character. Parking: consider how ON-street parking could help ADUs (and many homeowners and renters) by issuing neighborhood permits and changing winter parking rules for local streets. Alternatively, require one parking space, but make it easy to waive that requirement for an ADU where it is not needed. 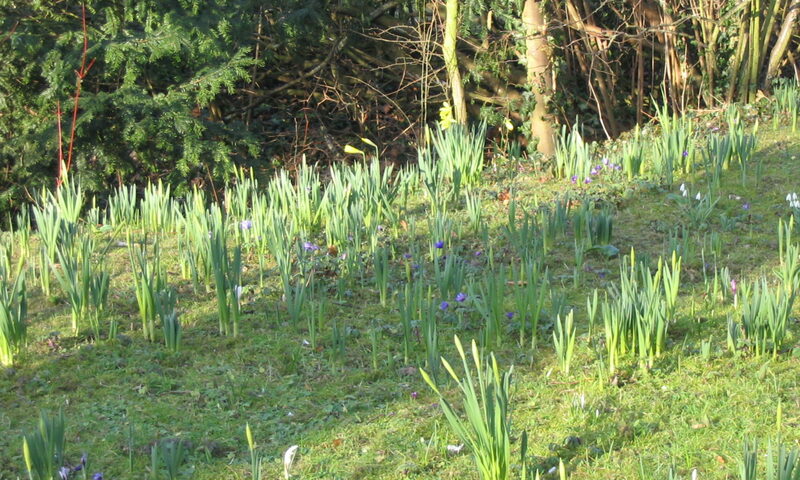 Lot coverage: Adopt a larger percentage which will not preclude ADUs on smaller lots. ADU size: Adopt a provision which is clear as to footprint or living space. For whatever number or percentage of the primary dwelling may be selected, make sure it does not inadvertently limit ADUs to only the largest lots. For height, consider specifying height for attached vs. detached units. Enforcement: parking and the possibility of poor tenant behavior are not part of this ordinance. Look to nuisance, noise, and blight laws and how they can be enforced to address any problems which actually occur. Rental code: The ADU ordinance cannot change the rental code, so more action is needed but, as with neighborhood character, this needs more discussion. Then talk about what regulations are needed looking to other cities and real research, not just public opinion. Because it’s New Year’s Eve, it must be time to review 2018, right? Although my favorite novel of the year was Michael Ondaatje’s Warlight, I’m having a huge amount of fun with The Art of the Fold, and I failed (again) to finish Gravity’s Rainbow, here’s the list of blog-relevant reading ((with some links to real reviews and commentary). 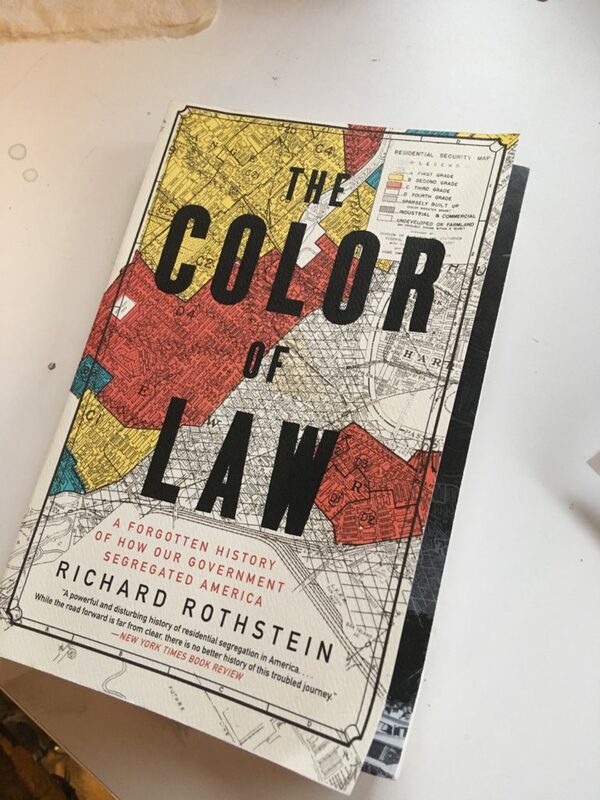 The Color of Law: A Forgotten History of How Our Government Segregated America by Richard Rothstein. Many people have heard about redlining and restrictive covenants on property. Many Minnesotans know about how I-94 between Minneapolis and Saint Paul eviscerated the (African-American) Rondo neighborhood. There’s much more and Rothstein builds the case for de jure (not “just” de facto) segregation in where African Americans were allowed to live, mixed neighborhoods destroyed to build new segregated housing, government financing and other programs not available to African-Americans…and we can see the effects in Northfield, too. The Power Broker: Robert Moses and the Fall of New York by Robert Caro. I don’t recommend reading this whole, huge book, but learning about how Robert Moses used the machinery of government to amass great power in appointed positions to build huge projects intended to further a very narrow but very clear vision is jaw-dropping. More broadly, Moses’ New York park, bridge, and parkway projects envision cities where everyone drives a car and neighborhoods in the path of “progress” are expendable; this development pattern was replicated across the country and finally the pendulum is swinging back to building communities which are more equitable, more connected, and more livable. 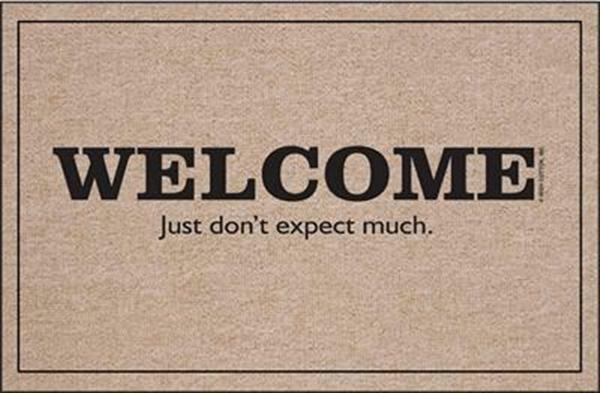 6 Rules for walkable cities – finding multiple messages for why walkability is important. 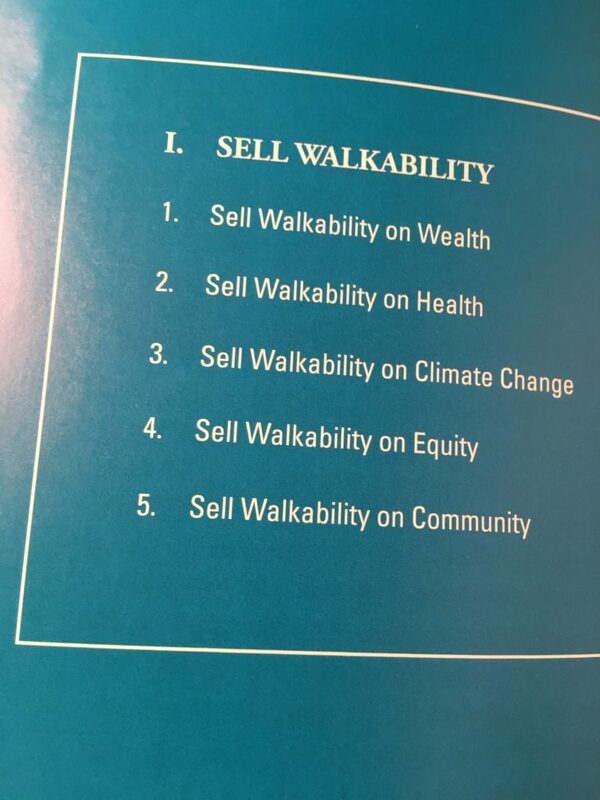 Walkable City Rules: 101 Steps to Making Better Places by Jeff Speck. Call this the antidote to Robert Moses with 101 ways (illustrated with case studies, graphs, links, photos from around the country), large and small, to build really walkable, wonderful places. I wouldn’t call this about “rules,” but more a catalog of possibilities and much which could be done in Northfield (and some which already have). Incremental development developments: ADUs will get easier to build as the City rolls back regulations on accessory dwelling units. Aurora Pharmaceuticals is the example of the pattern of development we need which is multi-story, on existing infrastructure, with quality jobs. Division Street reconstruction is a win for people walking and rolling. Big picture! 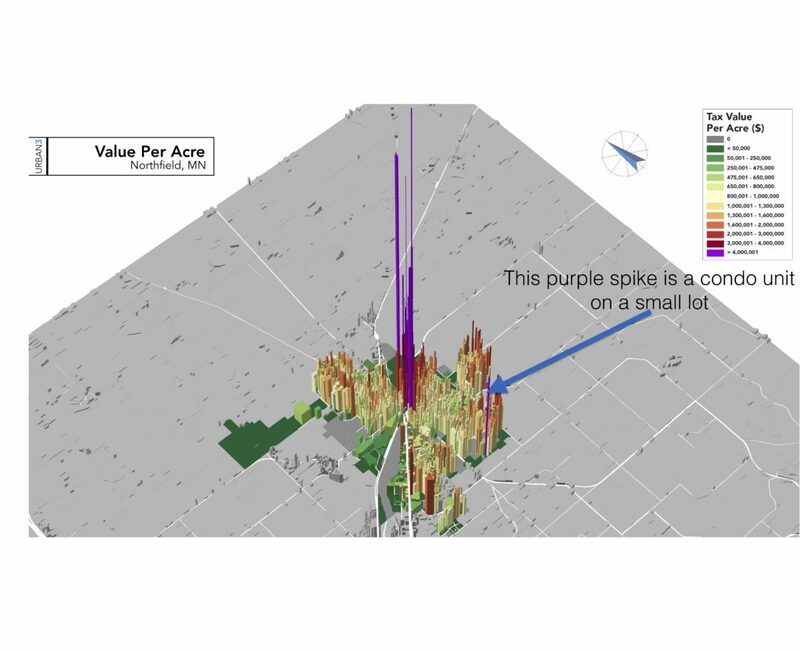 The EDA brought Joe Minicozzi of Urban3 to Northfield and his talk illustrated where the most highly productive property (in tax revenue per acre) in the city is located (downtown’s development pattern is the most productive ). I’ve been pushing Urban3’s ideas for several years (like here and here), but it really helps to have the expert talk about it and watching lightbulbs go on above audience members’ heads was great. Greenvale Park Elementary School: The voters approved bonding to build a new elementary school on the Greenvale Park campus, retaining the existing building for early childhood education. A huge, shining, golden opportunity to think about not only the building, but how kids (and adults) can get to the campus with special focus on helping people walk, roll, and bike and reducing vehicle pickups and drop-offs. 246/Jefferson Roundabout: I look at this one with great hope and sheer terror. This project has the capacity to change (for the better) how Northfielders can get around town for a generation (or continue to force us to drive). The City has received grant funding for a roundabout…this brings down the cost to the City and jumpstarts the project, but leaps to the conclusion that a roundabout is the best solution for this intersection. 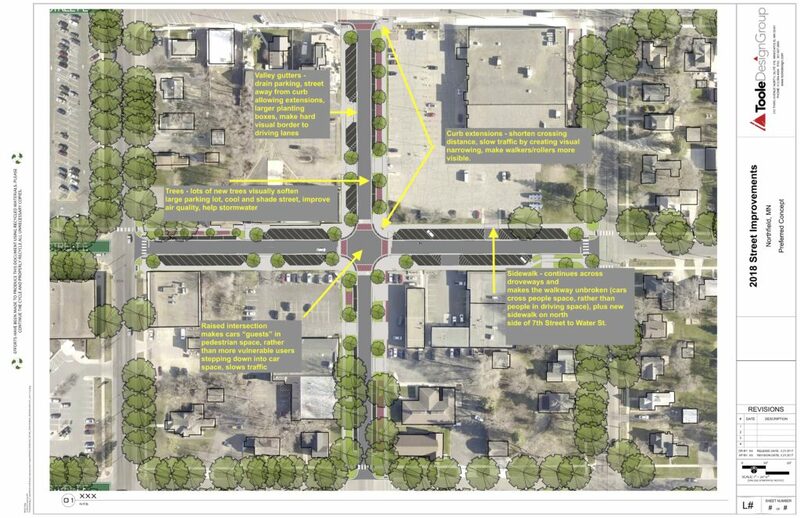 The goal: an intersection design which prioritizes people first and not vehicle throughput. Because this intersection links schools, senior center, and much much more, ensuring young and old people can safely and enjoyably walk, bike, roll, skateboard, skate, scooter through this intersection is the difference between kids being able to get to school by themselves…or not. Ice Arena: It hasn’t gone away just because voters said “no” on a bond and sales tax referendum. Northfield needs to work on both the process and the underlying policy issues here before spending a dime. New Community Development Director: Mitzi Baker began work as the Community Development Director in early December. In my first interaction with her during an event with all the finalists for the job, she said “Transportation and land use must be much more closely integrated” and I almost fell off my chair since I’ve been trying to convince city staff about this for years. I am so looking forward to changes in economic and community development in 2019, especially with the projects on the table. Bollards are booming since the 9/11 bombings in the United States and more recent vehicular terrorism in London (and elsewhere). 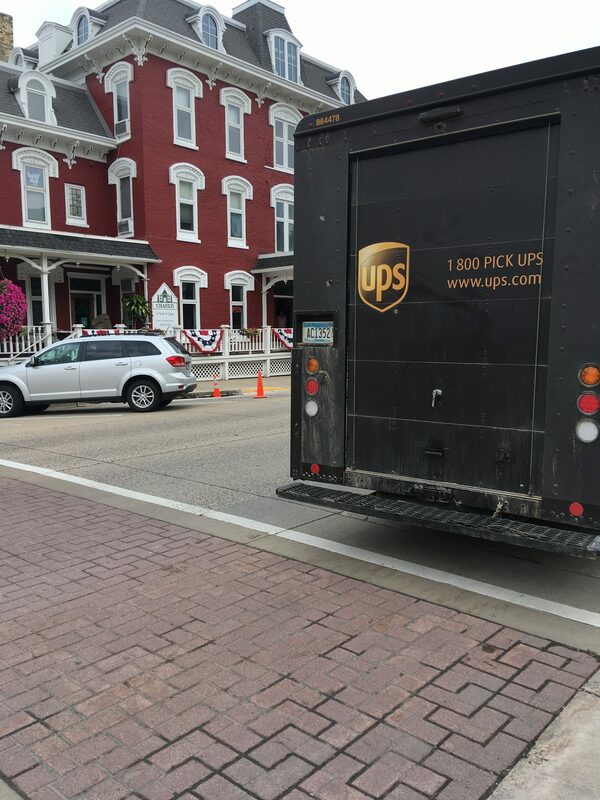 Bollards and other defensive architecture may protect buildings and sidewalks from vehicles, but they typically don’t encourage people to come enjoy public spaces. 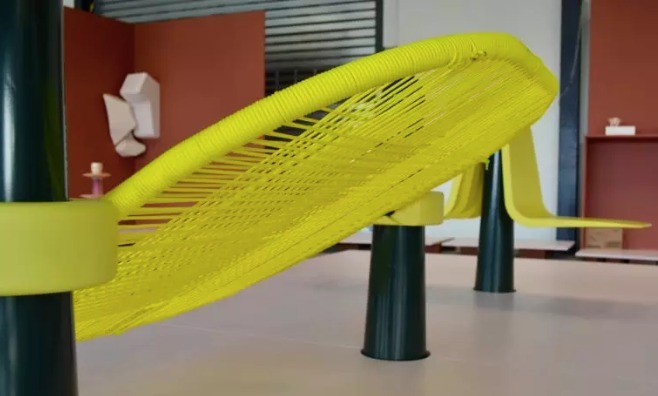 Jersey barriers are probably only redeemable by really great graffiti or art (you decide what the difference between the two is), but one Dutch company has created some ways to turn bollards into places to sit and bounce . What’s that in your neighbor’s backyard? It’s an ADU, planner shorthand for planner longhand “accessory dwelling unit.” It’s just a second, smaller dwelling on the same lot as a single family home. 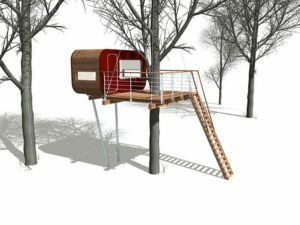 It could be an apartment above a garage, a Tiny House in the backyard, or and addition to the main home. Tomorrow, the Northfield Planning Commission will hold a public hearing on a revision to the Land Development Code which is intended to make ADUs easier to build in Northfield. ADUs are permitted in residential zoning districts R1-4 and N1-2 (beige, yellow and orange below). How many? One ADU per lot (and is included in the maximum number of units on a property – most areas allow 1, 2 or 3 dwelling units, so this is not a problem). How big? Currently, the property property must have a minimum area of 8,000 square feet and the ADU must not exceed 864 sf and 24 ft high and must fit within the lot coverage (building area ratio) limits. Where? The ADU must be part of a detached garage and at least 10 feet from the main dwelling. Design, etc. : The ADU must have separate kitchen and bathroom facilities and must be compatible with the main dwelling and the neighborhood. What about parking? One off-street parking space in addition to required parking for the main dwelling must be provided. Aging in place by building an ADU to move into as children leave home and renting the main house for income while staying in the same neighborhood. Creating more affordable housing, so adding rental units would add to the overall housing supply (the affordability of each ADU would depend on its location and its features) and construction doesn’t require land acquisition. Implementing policies on Age-Friendly Northfield, Climate Action, Affordable Housing, and non-motorized transportation. Reducing regulations helps get ADUs built. Consider the very different approaches taken by Minneapolis and Saint Paul: Minneapolis made it easy and 92 were built (through 2017 – including this one); Saint Paul limited location and regulated other features and one was permitted. Vancouver, Portland, and Seattle are also ADU standouts. There are other factors which help spur ADU development, but the zoning code is the Planning Commission’s remit, so that’s where we’re starting. How many? Still only one. How big? : Rather than 864 sf limit, the size is now proportional to the main dwelling at 50% of the primary dwelling or 1,000 square feet in size (whichever is greater) and 24 feet in height. So, if you have a 6,000 sf home, you can add a 3,000 sf ADU. On the other end, if you have a 1500 sf home, you may add an ADU up to 1000 sf. 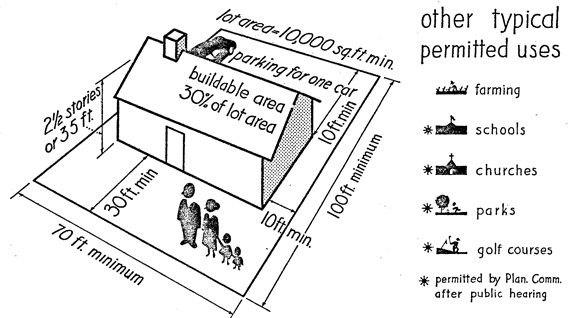 Lot size requirements have been eliminated and ADUs are explicitly exempted from lot coverage requirements. Where? 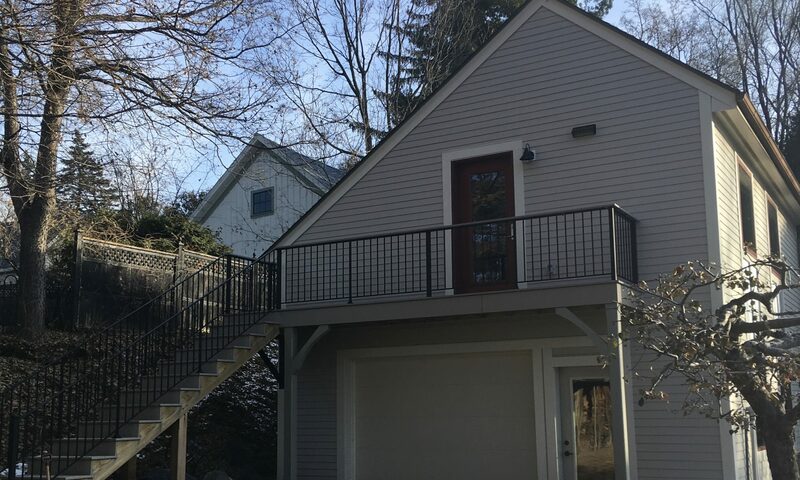 Now ADUs are freed from above the garage and may be “added to, created within, or detached from a single-family dwelling” but still must be 10 ft from the main dwelling. Allowing ground floor or detached ADUs can make them more age-friendly or accessible, too. Who? 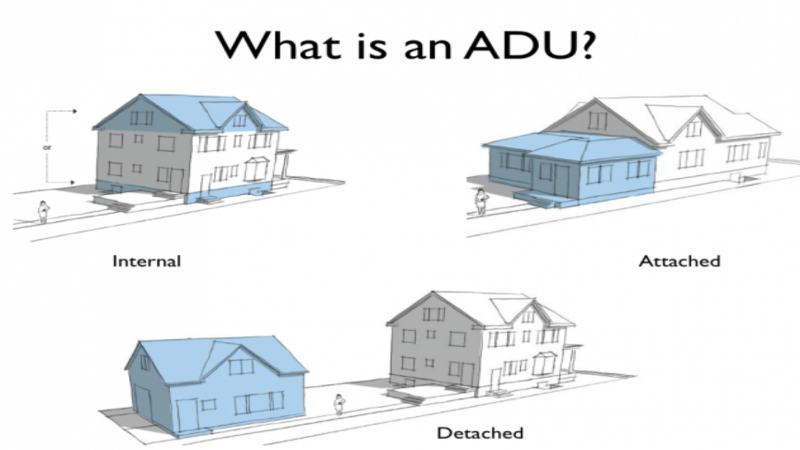 ADUs may be added to main dwellings which are not owner-occupied (i.e. adding a rental unit to another rental dwelling is permitted). Design, etc. Compatibility requirements have been eliminated because “preserving neighborhood character” is often an anti-change, anti-renter requirement. What about parking? No parking is required (it’s not prohibited, but simply left up to the developer to decide what’s needed) because it can add to the cost of the unit. Plus, Tiny Houses on wheels may be ADUs if installed on foundations and connected to city services. Process: The Planning Commission holds a public hearing Thursday, November 15, 2018 at 7 pm in the City Council chambers to hear testimony (please come! ), make findings of fact and recommend action to the City Council to amend the ordinance (or not amend it, but this is unlikely barring new information as the PC was united and unanimous in voting to send it to a hearing). The Council (probably in January) will vote to approve the first reading of the ordinance, then approve the second reading (where minor corrections may be made) and publication in the official newspaper. But there’s more. After this change is made, there’s still work to be done to fix the rental code. The rental code limits rentals to 20% of the houses in a single block in highly desirably, well-connected, affluent neighborhoods (like my east side neighborhood). The ADU revision is a positive step to let property owners decide how to use their property by adding units as they need or want to do so with benefits to the City, too. Amending the rental code will require a more direct conversation about housing with the people who are very concerned about what is happening in your backyard and its impact on their backyard. 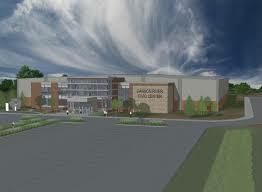 I applaud the Cannon River Civic Center organization for a sustained social media campaign, events, and tours to convince voters to support the referendum to fund construction of a new ice arena. But, like any political campaign, the information is cherry-picked for positive spin. No project is all good or all bad, but I’m going to be the critic to balance the cheerleaders. CIVIC CENTER OR ICE ARENA? The quote below is from the Civic Center website. The minutes of the Ice Arena Advisory Committee, however, tell a different story. At best, the facility might grow beyond the ice rinks over time, but at this point the “Civic Center” idea is imagination (“We imagine a space…” says the website honestly). The mission of the Northfield Ice Arena Advisory Committee committee was to “Serve as an advisory committee to assist and guide staff in a thorough review of current ice arena conditions, assess needs and demands, evaluate costs and alternative facility options resulting in recommendations to be presented to the City Council” and, if you read all the minutes of the Committee like I did (so you don’t have to! ), this is exactly what they did. Perhaps the facility will serve other sports (walkers, table tennis players, lacrosse, softball and baseball are suggested) someday, but the Advisory Committee had a discussion regarding other athletic facility needs within the community and concluded the task force focus was the arena and “not broader athletic facility needs that may or may not exist within the community and no detailed consideration of the events which might use the space. 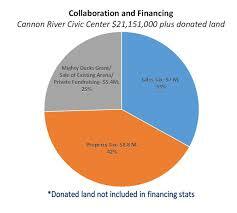 “The Cannon River Civic Center is a stunning example of a public-private partnership” is a troubling overstatement. The facility will be financed in large part (about 75%) by taxpayers in Northfield and Dundas. The expected Mighty Ducks Grants were limited to $250,000, but the funding for the grants was not renewed by the State Legislature so that additional public funding is off the table. Further, as a city facility, construction cost increases, operating deficits, and maintenance costs will be taxpayer-funded. The city can raise rental fees and work to market the facility to generate more revenue, but the responsibility rests with taxpayers. Private contributions include the donation of land valued at $216,000 for tax purposes, but an estimated market value of $850,000. The downside is this property will also stop paying property taxes (currently about $10,000 annually). Those interested in tax policy and process may wonder why the area which was touted as a business park has proved to be undesirable for business and so now is home to the tax-exempt Police Station, Arcadia Charter School, and the ambulance garage to be joined, if this is successful, by the City Arena. The private funds come from naming rights and advertising with no dollar projections attached and private fundraising of about $3.4 million. Right now, “Several pledges have been made, and we’re looking forward to announcing leadership gifts soon,”.but this arena has been a problem for more than 20 years; 20 years of fundraising and the miracle of compound interest could have been a significant contribution towards the construction and operation of this facility. For a comparison, the Northfield Public Library expansion funding was 45% private working through The Friends and Foundation of the NPL; the group is also building a permanent endowment to support the library. To have no private funds banked before taking this to the voters is arrogant (Northfield Hockey Association and other ice users) and irresponsible (Northfield City Council). Up to 30% of the sales tax revenue can be used for other parks and recreation projects in Northfield (about $2.6M over 20 years) and Dundas. Although this sounds wonderful at first glance, sales tax proceeds may only be used for capital spending for parks and this allocation raises serious equity issues. Capital but not operations: The sales tax could fund, for example, development of the new regional park in the south part of Northfield, but would provide no new funds for maintenance and operations. Your neighborhood park might get new equipment, but won’t get mowed any more often nor will there be any more staff time or new employees to do the work without allocating more tax dollars. Equity: 70% of the sales tax goes to an expensive facility for sports a tiny minority play; those sports are expensive sports even if scholarship aid is available. 30% goes to improve the park system which serves everyone else in Northfield at no charge at the point of entry (except the pool). 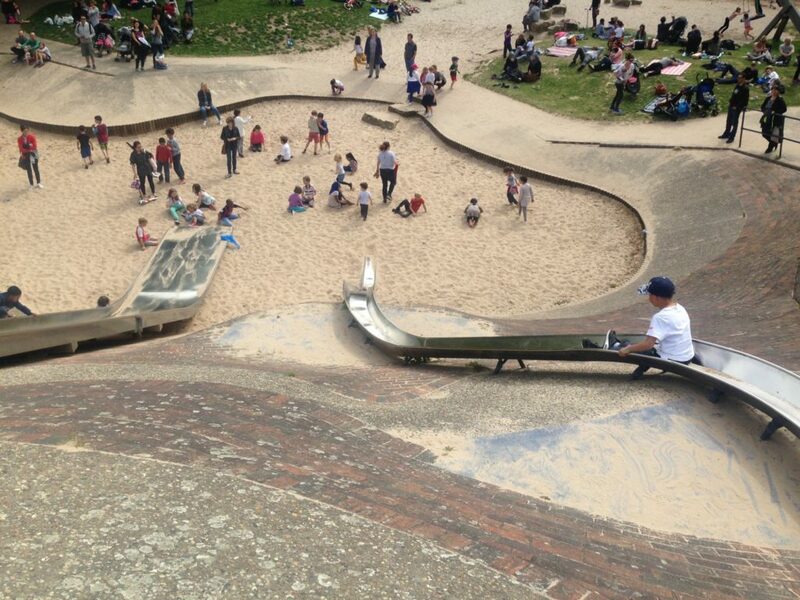 When the skateboard park was under discussion, the fact that it would be used by only a small slice of the population was considered a reason not to do it, but not so for this much, much larger project. If you look at that last column there’s a big deficit; breaking even (footnote 5) requires selling an additional 205 hours of ice time at $185 per hour on the secondary market. I’m not sure how the facility is “projected to generate a profit, beginning in its first season”. Tournaments will indeed bring people to town to eat, shop, sleep, and play. But it takes many millions to generate this impact. Are there other, ways to generate economic activity with a better return on investment? The Civic Center economic impact analysis projects a $1.8M impact which is comparable to the arts impact, but nowhere is there a comparison of how much Northfield has to spend to realize those amounts. We just don’t know about the value of competing the Mill Towns Trail, for example; $20M would go a long way toward completing that project (and other trails have showed impact on par with the arena projections). How do bike trails compare to the arena for economic impact compared to cost? 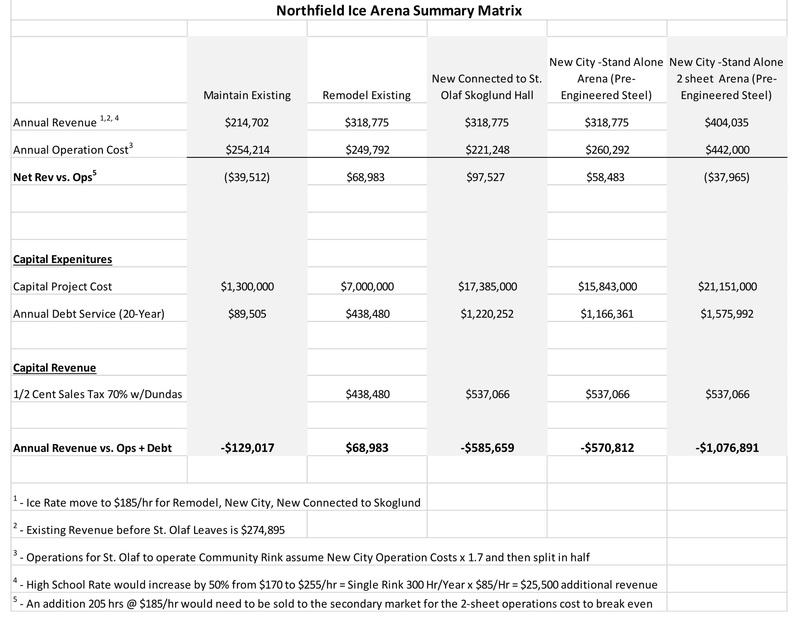 City failure to plan and budget: The City’s failure to repair, upgrade or replace the Arena is not a new problem, but a recurring practice; Northfield has waited for other City facilities to near failure (Safety Center) or arrive at complete collapse (outdoor pool) before acting to replace them. The City is avoiding responsibility by sending by asking voters to tax themselves without any assurance they’ll take better care of a new facility. NHA and other stakeholder failure to raise money: Before the City takes any action, private stakeholders need to show the city and the voters cash upfront; they’ve had at least 20 years. Costs and benefits don’t add up: The Civic Center idea has not been researched in any depth, ice sports are expensive and played by few, and the positive economics are hopeful but undermined by the Ice Arena Advisory’s own numbers and comments. The City needs to think carefully about how to provide recreation facilities and opportunities for the greatest number of residents and how much it costs to do so. Promised economic benefits need to be balanced against how much public money is required to generate that impact. 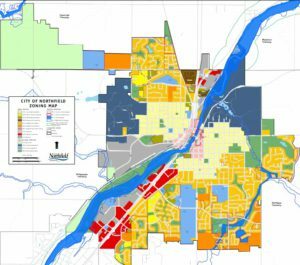 The City and the Cannon River City Center have not made a convincing enough case: Vote NO. NEXT STEPS: should the City be in the ice arena business? If the referendum fails, the City will then be faced with the problem of what to do with the failing Arena. If voters defeat this proposal, the next question needs to be whether the City gets out of the ice business and I’d say yes, it should. 1n 1996, the study process included the option “Exit the Arena Market” which was stated was “not feasible.” Yet, for the 20 more years since then, the City has not addressed the Arena’s substantial design and accessibility issues. The lack of action over so many years suggests getting out of the Arena market is not only feasible, but makes much sense for the finances of the city. 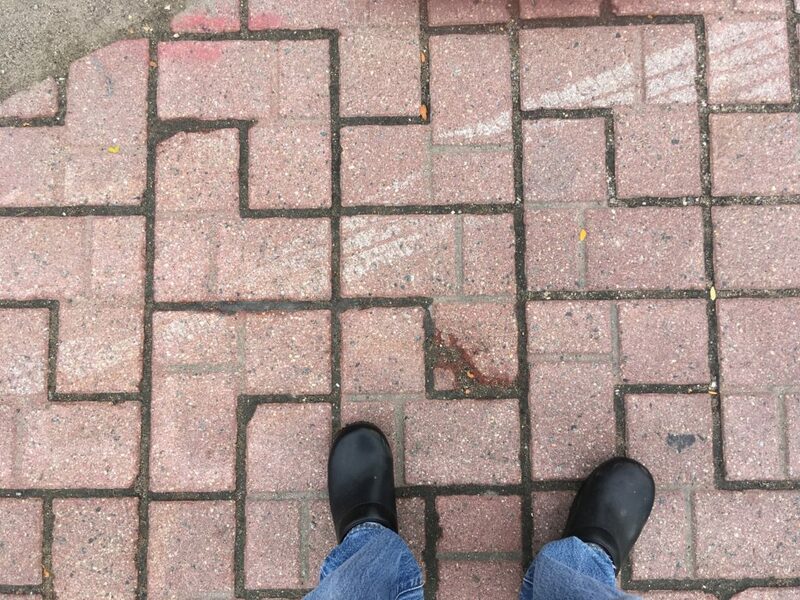 My current inconvenience and surprise at tripping aren’t very noteworthy as I’m still pretty spry, but I’m thinking ahead to how important safe sidewalks and street crossings will be for an older, frailer me and already are for older adults, people with low vision, those with limited mobility or using aids from canes to wheelchairs. 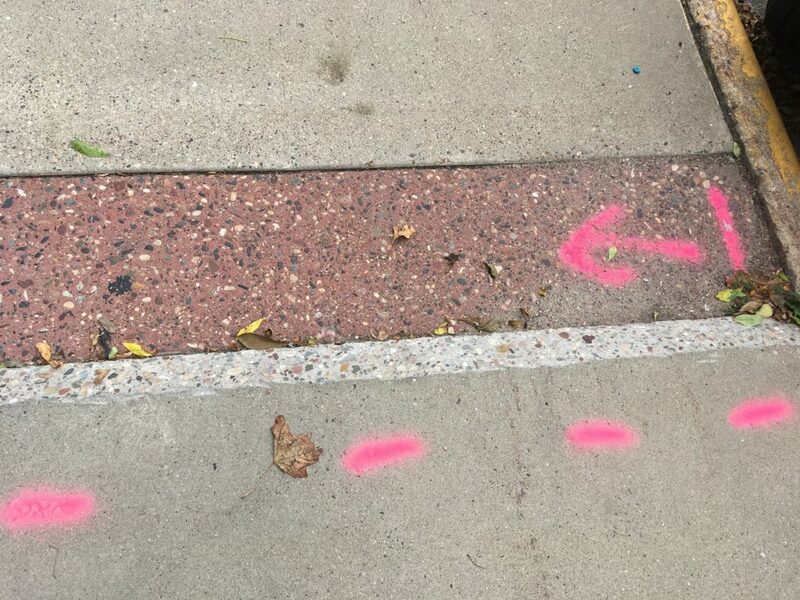 Northfield is getting much better about constructing safe facilities for walking and doing annual repairs on downtown sidewalks (adding sidewalks on Woodley; the new Division Street), but we can and should allocate transportation resources to do more to help people – all people – travel safely, not just people driving cars. In some places – Atlanta, for example – lawsuits have been filed by wheelchair users alleging ADA violations because of the condition of sidewalks. 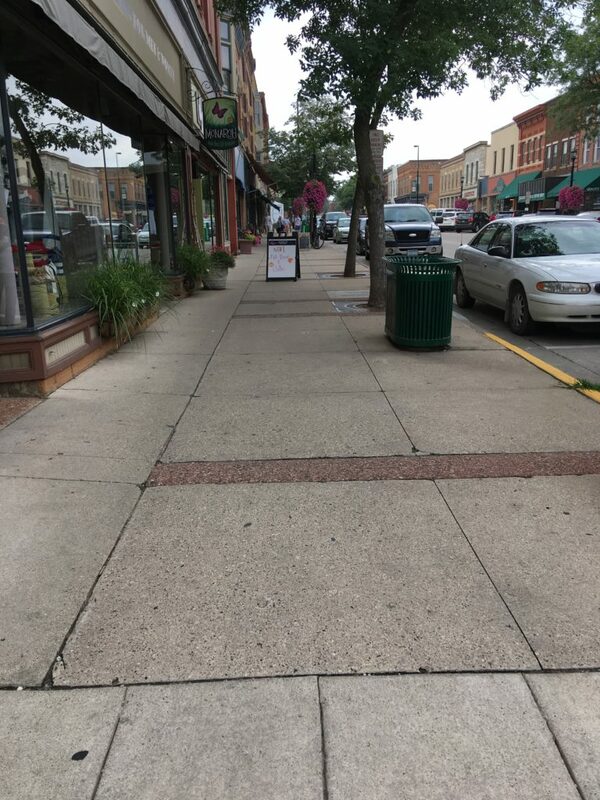 I’m not recommending litigation in Northfield, but am advocating for thinking about sidewalks as basic transportation infrastructure like streets and maintaining an index of sidewalk conditions, mapping sidewalk gaps, and building the addition and repair of sidewalks into the CIP and annual budget. “Are you sure that road is for 2-way traffic?” asked KYMN News about the new and improved Division Street. Social media commenters asked whether it was wide enough for school buses, how two trucks could pass, and where are the bike lanes. Yes indeed, Division Street remains 2-way (as City staff hastened to confirm on KYMN), but it is narrower than it used to be and some of the new features make it look especially narrow. But let’s unpack the first impressions to see that it really is wide enough for 2-way traffic, is wonderful for walking, and does not change the bike situation a great deal (which is not perfect). South of 6th Street, things spread out. Econofoods (now officially Family Fare Supermarket) is the only building on its block and set back behind a large parking lot with few trees, little landscaping and no benches. Buildings on the other side are closer to the sidewalk, but there are only two of them interspersed with another surface parking lot. There is street parking, but less of it because of driveways and less used because there are fewer things to walk to, and so there are also fewer people walking and rolling and the cars start moving faster. The downtown development pattern begins heading north from 6th Street. 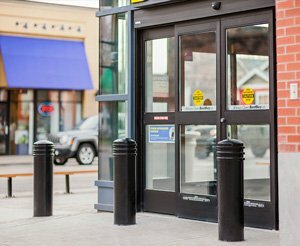 Buildings come right up to the sidewalk with small storefronts, frequent doorways, and large windows; the sidewalks are busy with people are walking (whether from their cars or walking into downtown) to businesses in a space with trees, signs, banners, flowers, bike racks, and benches. Cars move slowly to be able watch for all the walking and rolling people and allow access to the parallel and angled parking. Even with the slow traffic, however, it’s difficult for people walking to see and be seen by cars without inching out into the street to see around parked cars. trees and other landscaping to add shade, storm water management, and additional visual cues to slow down. 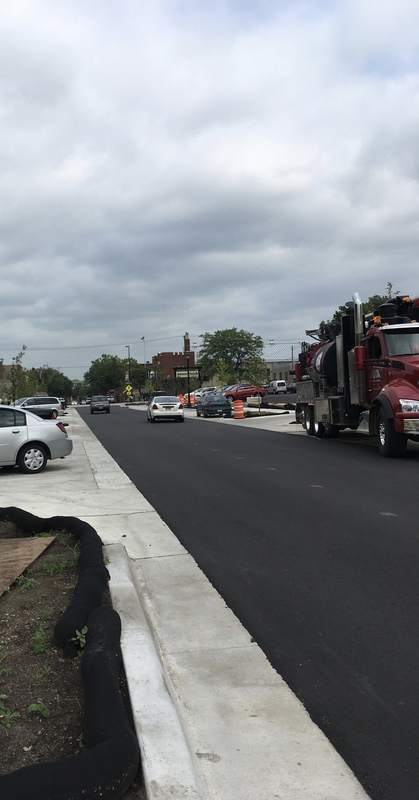 By slowing traffic and adding features to assist more vulnerable users the new street helps extend the walkable downtown street pattern another two blocks south and makes it even safer to cross the street. People, rather than cars, are centered. Division feels slower, doesn’t it? The different colored pavement and curb extensions make it look and feel skinnier even with the same width driving lanes. 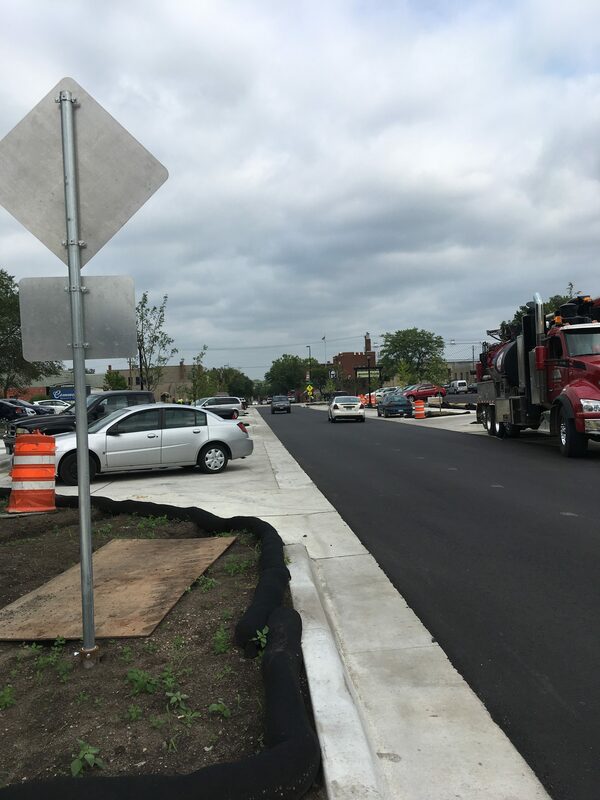 When Woodley was reconstructed, the street was widened in some places to a uniform 44′ curb to curb width, trees were removed (some ash trees, some in the path of the construction), sidewalk was added on both sides, and parking lanes were kept on both sides of the street. 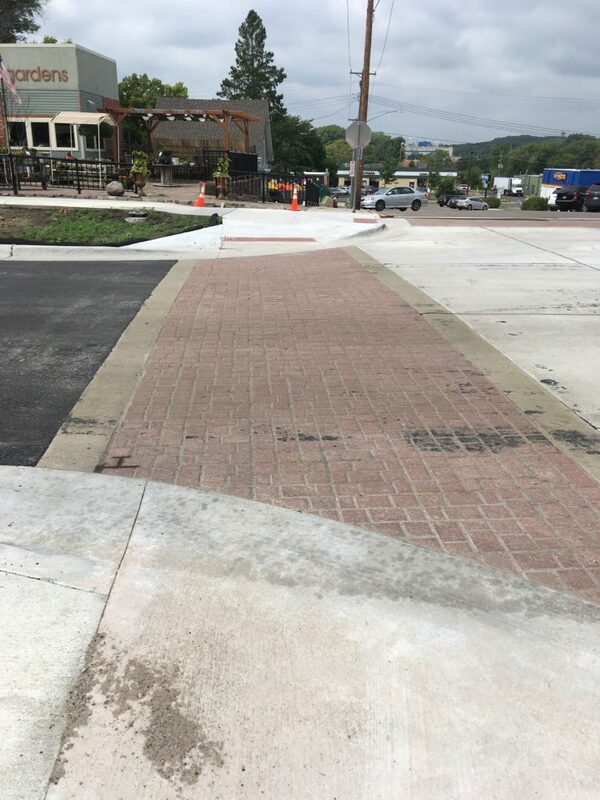 Small curb extensions were added at selected intersections to help walkers and rollers cross the street. 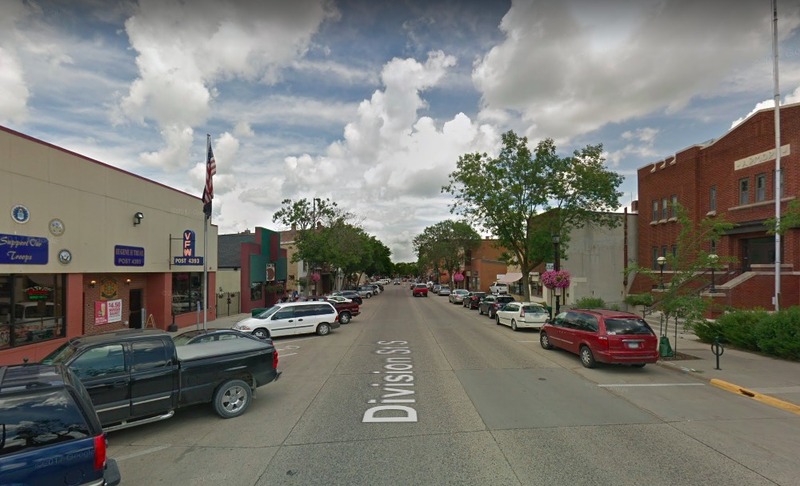 The overall look is a very wide street with wide open sky above and the 30 mph speed limit is difficult to observe without carefully watching the speedometer because there are no design cues to slow people down. But what about the bikes? Local riders have complained the street is too narrow and there are no bike lanes. They’re mostly right. The narrowness extends the downtown pattern another two blocks and this makes these two blocks just as problematic for bikes as Division Street from 2nd to 6th. For experienced riders, the slower traffic and heightened driver awareness should make this area marginally better. But for other riders (new, less confident, kids, seniors and any other people on bikes who are uncomfortable taking the full lane), the angled parking and door zone on the narrower street are scary and uninviting. A sharrow or two might be a small signal that bikes belong, but sharrows are just signs on the street. There are two messages here. 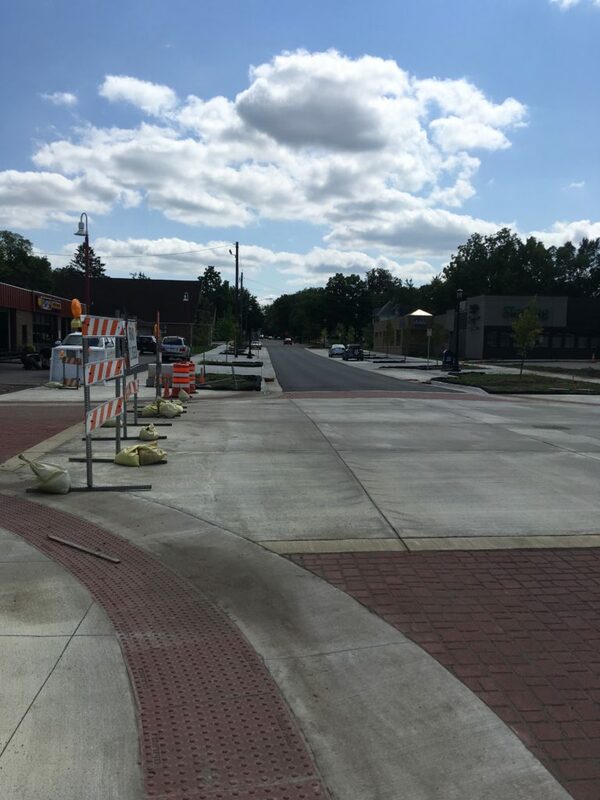 First, the new street prioritizes people walking and rolling in bold and new-to-Northfield ways. This is good. Second, there’s more we could do. The lack of bike lanes – or the lack of space for bike lanes – hints at how Northfield (and most other places) allocate space in the public right of way. Parking was a very big deal in this project with local business owners and residents concerned about each parking space removed. If Northfield had chosen to limit parking on these blocks, there would have been plenty of space for high quality bike lanes. 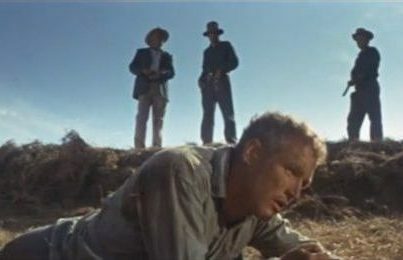 The problem is not that there is not enough space, but that the political climate is not (yet) favorable for allocating that space differently. This project designs people into the streetscape more than any other street project Northfield has built recently, but the focus is on helping people walk, not improving the bicycling. So, drive slower, walk happily and safely, and consider the cost of free parking to other road users. I’m a hockey fan. I grew up with a Rangers fan father, saw the short-lived Kansas City Scouts lose many games, watched the Flyers on (black and white) TV with my husband before we were married, received Flyers season tickets as a wedding present, had a subscription to the Hockey News for a decade, shivered in the Northfield arena while my daughter played Mite and U10 hockey, and now go to Gophers Womens Hockey games. No matter how much I like the game, I think the proposed referendum to finance the new ice arena via a sales tax and $17.8 million in new debt is not a responsible choice for the City no matter how great a game it is. The issue on the table and the ballot. Sell $17.8 million in bonds (debt financing) to raise the cash to finance construction of the arena. Pay annual principal & interest of approximately $1.5 million for the 20 year life of the bonds (that’s about $30 million in debt service payments). Create a new sales tax plus a motor vehicle excise tax to offset about 30% of the debt service payments. Bottom line: Property taxes will need to rise to pay for the $1 million of debt service not offset by the sales tax; the cost of buying things will rise as business owners pass the cost of the sales tax on to consumers. Dundas is also planning on asking its residents to approve the sales tax; the Northfield Council will choose between two resolutions – one which makes the project dependent upon Dundas voters’ approval and the other which is silent on that issue. One view is to relax and let the voters decide; if a majority of Northfield (and maybe Dundas) voters decide they want to pay for this project, then so be it. If they agree with me, then it will be voted down. I’d like to argue, however, that putting the issue on the ballot at all presumes the city is prepared to follow through on the results and being willing to take on a significant financial obligation (risk) that is disproportionate relative to other important city projects, benefits relatively few people, and does not appear to support the city’s declared policies on equity, inclusion, and good fiscal management. Schools: The 2017 Referendum asked for $23.5 million for replacing Greenvale Park Elementary School; the bond levy which also included a new high school failed. The Greenvale Park replacement may be on the November ballot along with the ice arena. So, the proposed ice arena will cost about as much as an elementary school. NCRC (1999): Approved by (a tiny proportion of) voters in a special election in 1999, the NCRC cost was $2.7 million. Being approved by voters does not make a project a good deal; the facility was intended to be largely self-supporting, yet the City has been subsidizing the facility and looking for ways to decrease its obligations from renegotiating leases to selling the building to tenants. 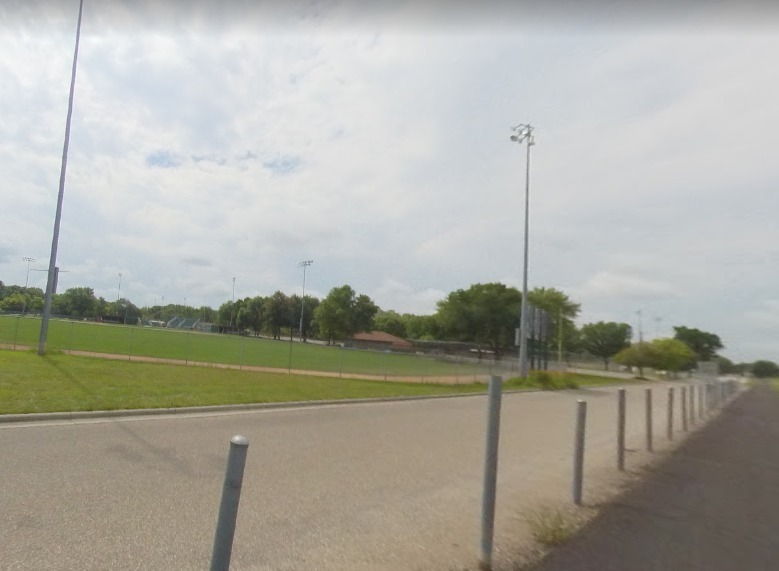 Soccer (2002): The Spring Creek Soccer fields were budgeted at $150,000; the Northfield Soccer Association developed and paid for the fields on land donated by the City. The NSA also pays for field maintenance. Between the in-house and traveling teams, soccer dwarfs hockey participation, includes many more from usually underserved groups. Outdoor Pool (2006): The new pool cost between $2-3 million financed by EDA lease revenue bonds (no referendum required). The pool is intended to be revenue neutral, but income from pool fees and concessions does not cover operating costs. Safety Center (2012): $6.28 million financed with lease-revenue bonds + approx. $6.25 K land purchase. A similar .5% sales tax was briefly considered to offset debt service payments, but met with swift, negative responses from the Chamber of Commerce and business owners. Northfield Public Library expansion (2015): The addition and remodeling of the Northfield Public Library cost approximately $3 million. $1 million was allocated from the City General Fund, additional money from the Library Gift Fund, but about 1/3 was raised privately by the Friends and Foundation of the NPL. These are not apples to apples comparisons. Like the ice arena, the pool has use charges intended to offset costs, but Northfield has multiple pools which extend the swimming season year-round. The Safety Center and Library are core public services which do not charge fees at the point of use and are intended to be funded by taxes. The soccer (and baseball) facilities are both city parks, but the sports organization pays on-going costs and passes costs along to players. 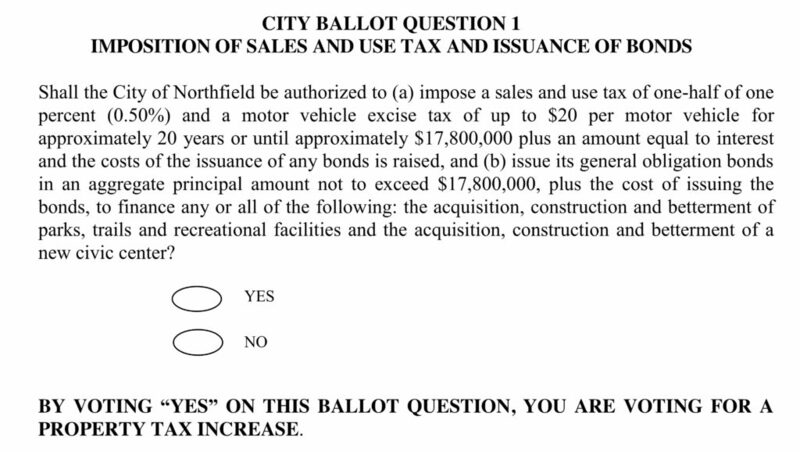 However, such a large bonding request plus instituting a new sales tax makes me pause to ask what else Northfield can do for the same amount of money and how does this recreation project serve Northfield better than others, like the soccer fields, which cost so much less (but serve more people)? What else could we spend $17.8 million on? 246/Jefferson Parkway intersection (and related transportation connections): Northfield has studied this intersection and tentatively planned a roundabout at this location. The City applied to MnDOT for funding, but did not receive it in the last round of funding. The City has long recognized the street network in this area does not work. Driving to the Middle School, Bridgewater and High School is bad; walking and biking are almost impossible yet it serves three schools (thousands of children), the NCRC (seniors), and soccer fields (500 youth soccer players. I’ve already had much (critical) to say about this intersection and the history of planning decisions which have put much pressure on this link. From choices made when planning the Middle School (Schools and where to put them) to more recent efforts to improve safety (Still Not a Safe Route to School), to looking to change the conversation about streets from vehicle traffic to community connections (Reimagining Woodley). Mill Towns Trail through Northfield (and fixing the segment to Dundas): Building the Mill Towns Trail has been inching along for decades, but Northfield could kickstart things by completing the segment through town from the Cannon River to the east and with a better connection into the heart of downtown. The trail is planned to cross 246 at Jefferson Parkway so it dovetails with that improvement. 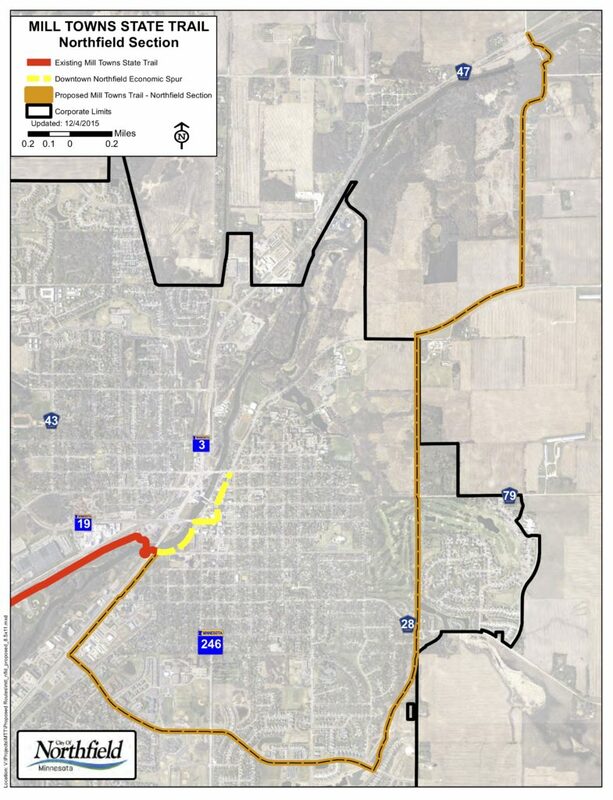 There is a whole subdivision of economic development literature devoted to “trail-based economic development” recognizing the impact a trail can have (like the Root River Trail). Would the tourism impact of a trail be a better deal? Flood control through downtown and river enhancement: Recent flooding has highlighted how vulnerable downtown is. 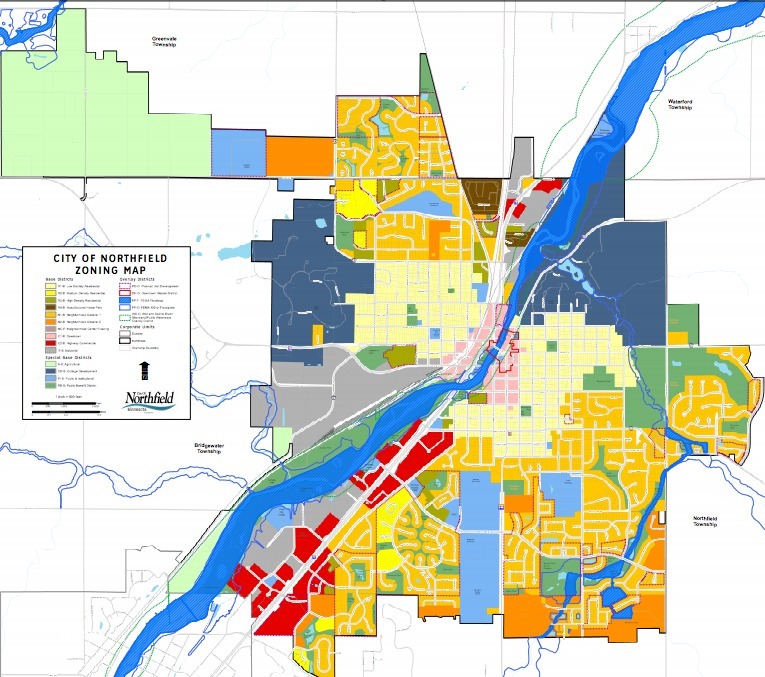 The Cannon River and the riverfront are prized assets cited for defining Northfield’s sense of place (and its place in history), as economic drivers, as recreational delights, and in need of enhancement, protection, and redevelopment (like in the Strategic Plan). How much debt is too much? This project asks Northfield to issue a large amount of debt; I have not yet heard a discussion of how this fits into the overall financial plan for the city. Has Northfield developed a plan and budget for maintaining and replacing facilities as they age? Northfield has waited for facilities to nearly or completely fail, then made decisions in haste. The current arena has been inadequate for years, the swimming pool was leaking and had to be shut down for a season forcing quick replacement decisions, and the Safety Center was overcrowded and subject to flooding requiring quick action. What happens if the naming rights and fundraising aren’t as successful as planned? Current financial planning depends on advertising, naming rights, and private fundraising. Will the project depend on a certain amount of money being raised before ground is broken like the skatepark? What happens if the projected revenue does not cover costs? Will the City subsidize the arena as it does the pool? How much is it willing to pay? Who pays for the Riverview Drive street extension to the arena? An extension of Riverview Drive to reach the service area for the arena is on the plans, but not in the budget. Are the additional spending and lodging tax revenue projected a good return on investment? The economic boost projected because of the increased ability to host tournaments and other events is not being compared to other economic development efforts the city might make, the amount generated by other city attractions (like bike trails, for example) nor does it directly help pay for the debt. Why should we pay this much money to improve our other parks? There is a red herring in the logic of this project where the ice arena is being touted as being a way we can pay for on-going park maintenance because 30% of the funds may be used for other recreation spending. There are other, much cheaper, ways to manage our park and trail system without spending the 70% on an ice arena. 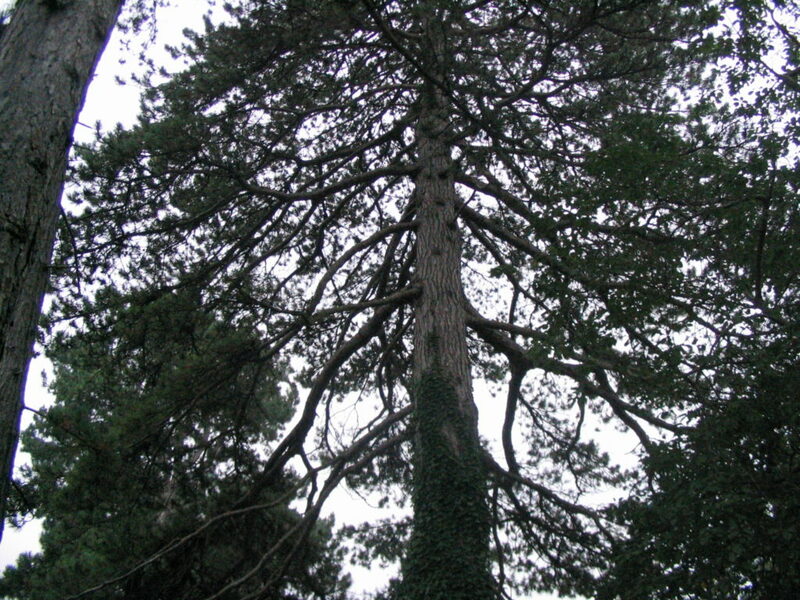 If funding parks is a priority, there are better ways. Obviously, I’m voting no and urge fellow taxpayers to think hard about how our City government allocates our tax dollars. 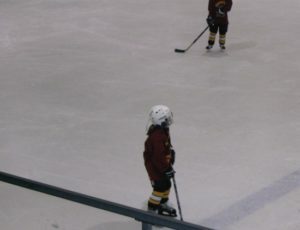 2004 Jamboree – I bought warmer clothes to watch U10 hockey because the arena was delapidated 15 years ago; Northfield could have planned better for improvement or replacement. Planning looks ahead to set policy and draft regulations to guide how a town grows. Development works now to get projects approved and built. When the development does not fit the planning, which should prevail? The long-term planning or the money-on-the-table-right-now development? This is not a theoretical question; planning and development ran smack into each other Thursday, April 19, when the Northfield Zoning Board of Appeals denied multiple variances for a proposed Starbucks drive-thru at the corner of Highway 3 and Second Street. The Starbucks proposal was a near-perfect example of the type of development Northfield’s recent planning documents sought to exclude from this location, so the unanimous decision to deny the variances could be seen as a clear win for planning (the vote was 5-0; I could not attend the meeting and Jay Jasnoch was also absent). However, the decision should not be considered winning a contest, but the start of some different conversations. The problem: Variances let developers break the dimensional zoning rules if certain conditions are met. In this case, the Starbucks drive-through needed to break rules on where the building could be located relative to public streets and where the drive-thru lane can be placed. allow the drive-through in the front setback. (e) The variance, if granted, will not alter the essential character of the locality. (2) Economic considerations alone do not constitute practical difficulties. NOT the problem: It would be interesting to debate whether Starbucks is a good company, whether Starbucks brews good coffee, whether the Unicorn Frappuccino was misguided, why pumpkin spice lattes take over the world every Fall, whether local or franchise businesses are more desirable in Northfield, whether Northfield needs any more drive-throughs, coffee, or Starbucks but none of these are relevant to the variance decision (but hold these thoughts). The variance problem. The staff memo found that all variance criteria were satisfied, but the Zoning Board of Appeals decided differently (not the Planning Commission as local media stated – the ZBA and PC are the same people, but when acting as the ZBA the panel has a different, quasi-judicial, role and final administrative decision-maker; as the PC, the body is advisory to the Council). After watching the meeting video, my understanding is that ZBA members generally agreed about (c): the coffee shop use was reasonable. The plight of the developer was less clear from ZBA members’ comments. On one hand, the site development for the original PUD tied the hands of future development, but the choice to build a drive-through on such a constrained lot was the developer’s choice. Essential character (e), was alluded to by ZBA comments, but not discussed in detail. I would highlight the distinction I used to start this post of future planning and right now development. Right now, this area is near other highway businesses and a drive-through Starbucks is not out of place right now and it would be reasonable to find it would not alter this character. But, the Comprehensive Plan and the Land Development Code purpose for this zoning district identify this area (and the Crossing original PUD and Gateway Corridor Improvement Plan peg this corner in particular) as a key gateway into downtown Northfield where development will echo the historic with buildings close to the street, where walking and biking are emphasized over driving, and where the distinctive, Northfieldian place begins. As ZBA members gave their rationales for their votes to deny, it was the conflict with this vision which was foremost and I’d distill the concerns to this: allowing the drive-through would not be a step towards building the planned future essential character and Northfield needed to find a better, more appropriate first step toward the planning goals. This decision should not be treated as planning killing off development nor of planning winning a battle in the development war or any other adversarial interpretation or the outcome. I’d say the ZBA interpreted the policy documents straightforwardly and applied the rules correctly, but now the problem remains of how to take that first step toward making the planning vision more real. Tax value: Downtown is Northfield’s richest tax base on a per acre basis. Building taller buildings with small or no setbacks concentrates value and makes more use of a smaller amount of infrastructure. Getting around: When buildings and businesses are close together and close to the street, how we travel changes, too. 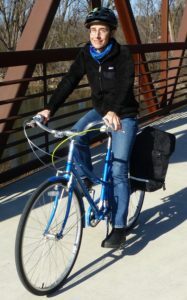 Walking and biking are easier because destinations are closer together. Street entrances and windows make walking more pleasant because there are things to look at. The narrower roadway (both visually from buildings and trees, but also from street parking) slows vehicle traffic to make walking, rolling and riding safer and more pleasant. A sidewalk alone, like those along Highway 3, does not make a place pedestrian-friendly. Environment: Although not a part of the ZBA’s deliberations explicitly, the drive-through model promotes driving (more fossil fuels, bigger carbon footprint), adds impervious surface (more run-off into valuable water resources like the Cannon River), and uses more land. As Northfield develops its first Climate Action Plan, considering the larger picture of how development patterns can help is critical. Despite the very clear plans for this intersection, right now there is little to make it easy to develop what Northfield says it wants. For a small, walkable, downtownish business, this corner is isolated. Although highly visible from the highway, this location is not a pleasant walk from Division Street (yet) and there are no other downtown-scale businesses to help draw foot traffic. The planned riverfront walkway connecting to the Crossing to the Riverwalk south of 2nd Street has not been completed. The commercial development on the north side of the Crossing is small-scale, but focused inward to the parking lot rather than adding to the Highway 3 streetscape and helping to connect to the corner. The access into the site is constrained by its location on two state highways. The roundabout and interior roadways take a lot of space which might be used better. The south corner across 2nd Street is empty and crossing the street on foot or bike any direction at the 2nd Street and Highway 3 intersection is unpleasant. How well do the City regulatory tools make developing this area “like downtown” easy, predictable, and as cost effective as possible? What revisions to the Land Development Code regulations would help carry out the purpose of the regulations and the vision of the Comprehensive Plan? 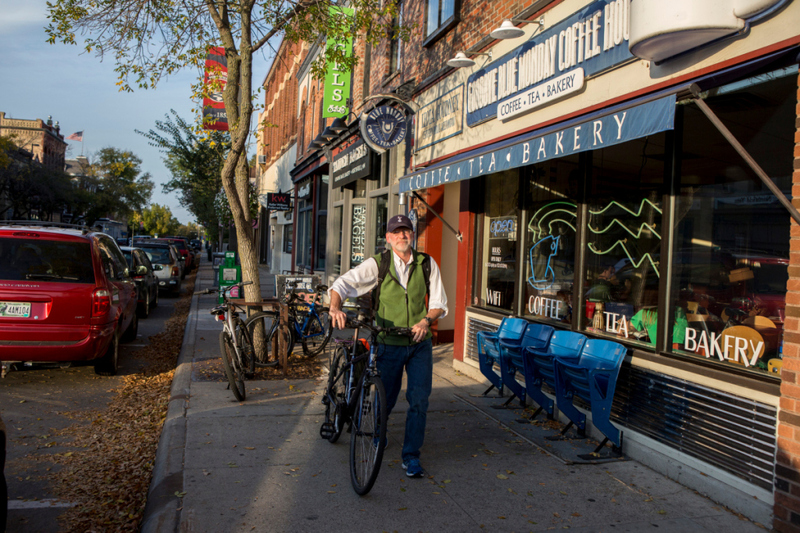 How will Northfield’s economic development efforts be directed toward carrying out the land use planning and climate action goals of the City? Are current economic development resources allocated effectively? 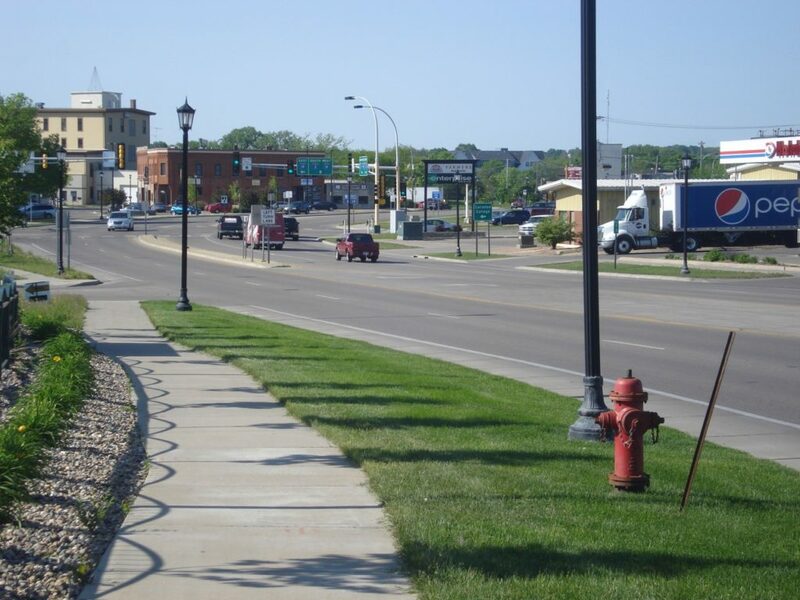 How will Northfield take advantage of advances in street designs, public health research, and other tools to evaluate regulations and projects for better active transportation results? How can Northfield consider the impact of both its land development pattern and local business development compared to national franchises? Rather than look at economic development as simply any growth in jobs or the tax base, how can Northfield compare both in terms of tax value compared to the cost of city services and infrastructure, creating living wage jobs, and keeping more dollars circulating in the local economy? Finally, these questions are all big picture and long term. Right now, what steps can be taken to help connect The Crossing to downtown by improving the walking, rolling and biking connections? How can economic and community development staff think differently to market this property or develop proposals which will fit both the real estate and the planning goals. High value, walkable development: Downtown block bounded by Division, Washington, 3rd and 4th Streets. The playgrounds are much more open-ended. 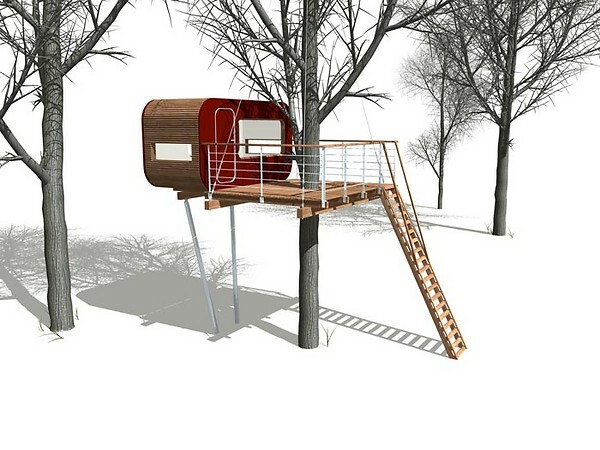 They also have riskier, more adventurous elements, like giant tree houses or huge slides. So they attract a much wider age-range. A lot of the playgrounds here are very small. You can’t get high up, which is something people like: giant swings, big spinners, tall slides. There’s a lot of physical stimulation in the environment there. I was seeing people 85 years old going down three-story tall slides. When Grandma is climbing three, four sets of stairs over and over again to go on these slides, you know there’s something special happening.